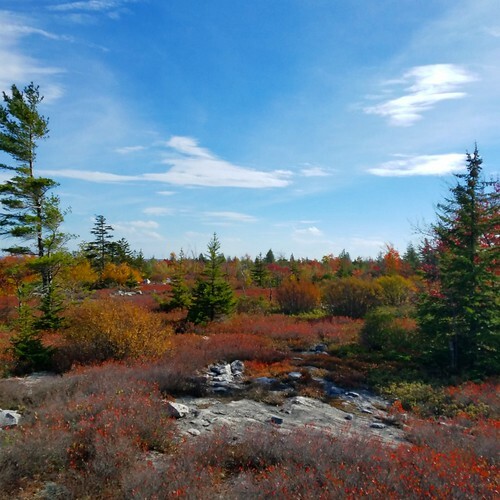 In October I led a grand hike to some of SGL 57’s most scenic places, including Flat Top, Spruce Ledge, and the Bartlett Mountain Balds. Since I’ve described these places before, this description will be abbreviated. The total hike was about 12-13 miles, and three quarters of it was on a trail of some kind. The remainder was off trail hiking. We began by parking along Windy Valley Road at White Brook, crossed the meadow, and hiked up on an old grade. We turned left onto another well established grade which meandered up to Flat Top. A side trail through laurel brought us to the fine vista looking up the Mehoopany Creek to Red Rock. Beautiful fall colors were already covering the higher elevations. Our off trail hike began to the west to reach Spruce Ledge. Along the way we passed large boulders, caves, rock shelters, and chasms. The forest became thick as we neared the ledge with spruce. After fighting through, we reached the ledges with great views over the wilderness of SGL 57. The fall colors were excellent. The high elevations of this hike always seem to have superb fall colors. We took a long break at the ledge in the warm sunshine. We continued along the ledges, enjoying views along the way. Upon reaching a fern meadow, we followed an old ATV trail that passed near more ledges, offering even better views as we looked down the gorges. The old trail was a little hard to follow in places, but it was a beautiful walk. The hike took us across bedrock balds, deep hemlock forests, and down to the headwaters of White Brook. Next, our hike continued north on a jeep trail to the Bartlett Mountain Balds. At a wet area, the hike turned left on an old ATV trail which took us near the base of the balds. An off trail hike through thick brush brought us to the balds, which still had great color and nice views. It’s always a pleasure to hike to the balds. We retraced our steps back to White Brook, and then made the steep descent back to the cars, tired after our long, beautiful journey through SGL 57. I wish I could have been apart of this one. Thanks for posting this information. I note too that Spruce Ledge doesn’t seem very far away from Flat Rock Vista. 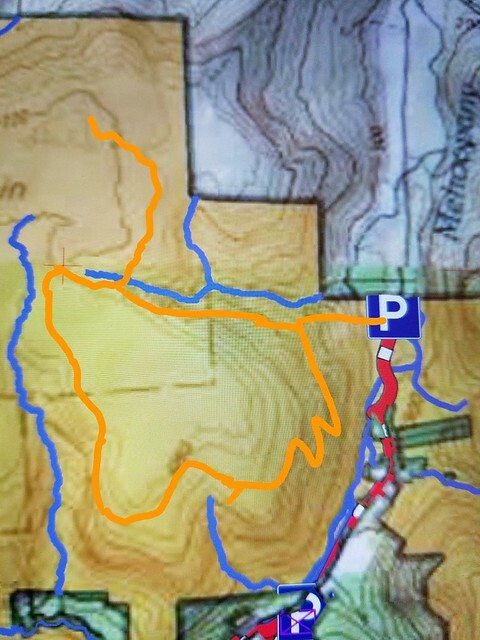 Please verify the distance between these two points and if there is a navigable trail connecting them. Thanks Jeff! Maybe a little less than a mile between the two, no established trail. I presume too that Preacher’s Rock and Spruce Ledge are one and the same? Along the same escarpment, but preachers rock is about half mile north. Spruce trees diminishes as you hike north on the escarpment. Jeff, I was one of the participants you led on this hike. The day was awesome. We enjoyed some fantastic sights as you described here and experienced some great Pa hiking. Your “off trail” navigational skills were especially impressive. Thanks for leading us and following up with this description of where we were. Nice to meet you and I’m glad you enjoyed the hike.